There are many different kinds of rugged computers, and they come in a number of different types. Some are used by the US military, and are made to hold up to particular standards set by that organization. 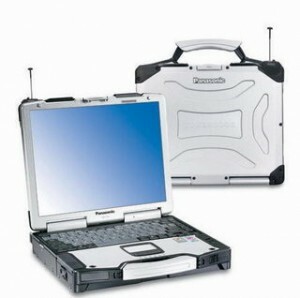 A number of different companies make rugged computers, including the famous Panasonic Toughbook. However, Getac, Motion Computing, Twinhead, Itronix and a number of other companies also make these strong little machines. If you’re thinking of buying a rugged computer, you need to look at what it can offer you and think about what you really need it to do. Not every computer is made for the same conditions. Here are a few problems rugged computers might encounter, plus the ways they protect themselves from those stresses. Some of the most common threats include drops, falls, and jarring – from a desk, while in transit, or even a tumble down a long drop. This could damage the casing, screen, and hard drive, and computers that will resist this kind of damage must have a protected hard drive – these drives can sense motion and will stop operating. There are also computers with light metal alloy cases and shock protected screens. Another common issue is vibration, which causes failure of many different parts, including the keyboard. If you’re likely to be using a laptop in a large moving vehicle, you may have this issue. Vibration protected laptops have shock mounts for all internal components. Moisture and dust are two major enemies of your computer as well. Spills, environmental dust, rain and condensation can all enter through cracks in the computer and damage the internal components. Some rugged mobile computers are made with seals around every seam and port to keep dust and water out and allow them to be used even in the rain! Extreme temperature variations are also a problem, with computers subject to very high and very low temperatures. If you’re working in the field or you need to leave your computer somewhere without climate control, you need to know it will work. An insulated computer may have a cooling system that can handle hot climates, or even a small heater for cold ones. A rugged computer might cost more than an ordinary one, but for many uses, from traveling to outdoor work, it’s worth it. Only purchasing rugged hardware can give you the certainty that your computer is going to work wherever and whenever you need it to, no matter what. A consumer grade laptop is great if you never leave the office, never change temperatures, and aren’t in danger of dropping your machine. However, if you’re going to be putting your computer under any stresses at all, a rugged machine is definitely the way to go. These are fantastic and everyone wanted to own these rugged computers. But you didn't mention the prices of these very rugged and tough computers.